The Skinny: Tear-jerker from the guys who would go on to create the United Filmmakers Organization (UFO). The drama and the execution are not as polished as their later works, but it's still an affecting movie. 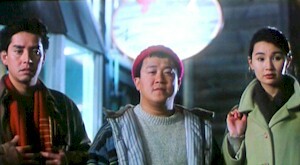 Pre-UFO drama from UFO’s main men, Peter Chan and Lee Chi-Ngai. This is an effective, though schmaltzy tearjerker about two lifelong friends, Alan Tam and Eric Tsang. Eric is a kindly, self-sacrificing man who gives everything up for those he loves. This includes a romance with the woman he loves, Olive (a winning Maggie Cheung). When it’s revealed to him that his easygoing buddy Alan digs Maggie and vice versa, he gladly steps out of the way to let them get it on. Alan eventually goes on to become a huge popstar (which makes for some easily obtained footage at one of Alan’s many concerts), leaving his two friends alone. When it’s revealed that Eric loves Maggie, the whole thing collapses, though a final plot device allows for some tear-soaked closure.